As a wave of boxes rolls out of the truck, take a deep breath, consider these tips, and dive into unpacking! 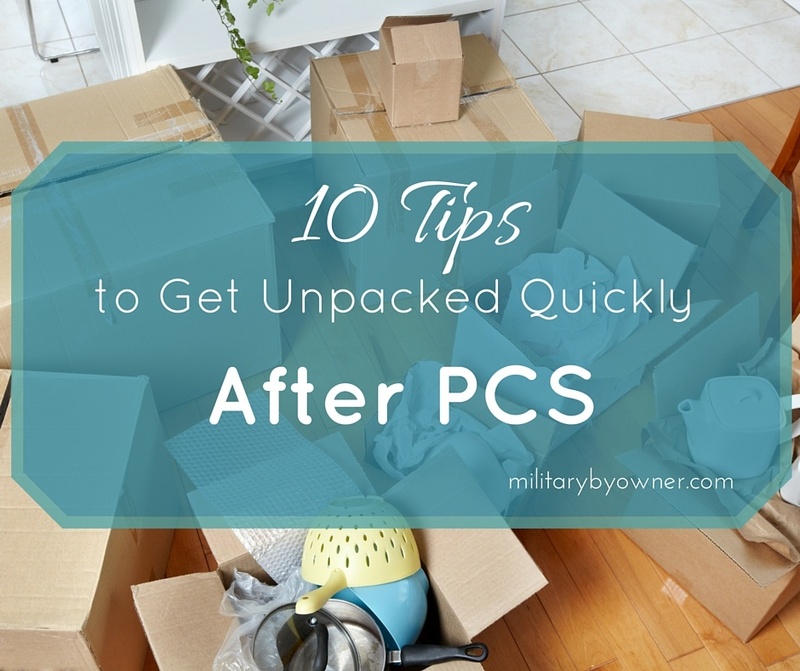 Military spouses know that "Unpacking Day" may not be all that much fun! But with a list in hand, you may feel more organized and that may keep the vibe positive. To help your day go quickly, consider playing some upbeat music, splurging on tasty snacks for breaks, and simply make the most of the time you spend with your resilient family. Working together with your family, try to designate a spot for each household item and direct a place to unpack each box. With everyone pitching in, you’ll be on the fast track towards feeling more settled. 4. Comfort first! Look for little ways to help your family feel at home. Right off the bat, consider setting up the beds and unpacking the bedding. After this long, busy day, you'll all appreciate plush pillows, cozy blankets, and a comfortable bed. All roads tend to lead to the heart of the home, the kitchen! When the kitchen goods have been unpacked and the cupboards organized, consider putting together an easy recipe for the hungry tummies in your family. 6. Make room for the necessities. Sorting out the essentials to stock each bathroom may be your next priority. If you have kids in the house, unpacking the boxes of their favorite toys may also be an important request! If kiddos are happily occupied with things that remind them of the comforts of their previous home, they may feel more settled in this new place. 7. Take it one box at a time. Not sure where each box should go? Never fear! It may be helpful to set up a “staging area” for boxes. Then, empty each box, one at a time, until everything has a place. If you organize as you go rather than opening several boxes at once, it may make the unpacking chores a little less overwhelming. As you empty boxes, clear out as many as you can from your living space. Place them up for grabs online with websites like Craigslist or Freecycle, offer them on a neighborhood Facebook group, or gather them and fill your recycling bins. 9. Take a break! A change of scenery may be just what you need. Plan one fun thing to do outside of the home each day as you unpack. It can be as simple as a walk to a local park, going on a bike ride around the neighborhood, or rallying your troops to go see a movie. After spending some time away from the boxes, you may return refreshed and willing to get back at it! 10. Get connected! Search online for free things to do in your new city. Follow a local newscast or read a local publication for upcoming events. This may offer a better sense of what is planned around your new community. Greet your new neighbors and ask them what their favorite local spots may be. From a trendy coffee house to a tasty hole-in-the-wall Mexican restaurant, the neighbors we've met over the years have shared superstar recommendations. Meet the fellow parents at your children’s school, or chat with parents at your kids’ extracurricular activities. Find out what family friendly activities the locals enjoy and what community resources are available. When you reach the point where you feel settled, jump for joy! Here's hoping you may enjoy a relaxing sunset from the comforts of your new address!